"I think that the Pyrenees, with Alejandro and all of them by my side, will be a good opportunity to turn things around in our favour." Numerous media were present at the Movistar Team's hotel in Pau during the press conference offered by Nairo Quintana and Alejandro Valverde during the first rest day of the Tour de France, the telephone squad's duo now seventh and ninth overall at less than two minutes' distance from Chris Froome (Sky). The event started with a support message from both riders to Ivan Basso, the Italian cyclist from Tinkoff-Saxo, who announced minutes earlier on the very same venue he had been diagnosed with testicular cancer. “On behalf of myself and the whole team, we send him our best wishes and full support," said Valverde, whom Quintana seconded: "It's sad to hear news like that. We send him all strength from here." Quintana still feels "sad" about the time loss - one minute and a half - on stage two, yet he considers that the first half of the race developed "in a good way. The roster is still full, with a couple of crashes yet with no major complications, and performing really well, as everyone could see yesterday in the team time trial. I think that the Pyrenees, with Alejandro and all of them by my side, will be a good opportunity to turn things around in our favour." The Colombian doesn't dare talking about GC favourites at this point of the race: "We could see some details, but the climbs were actually short, steep ascents, suited for explosive riders, which doesn't tell me much about who is doing well or bad." Quintana also thinks that "any day could become crucial - the only difference between the Pyrenees and the Alps is the former coming in the second week, and the latter, in the final one", though he did speak about La Pierre-Saint-Martin, which will be tackled on stage ten: “It's a regular climb, really demanding and one where temperatures could play a role - they say it usually heats up more there. It's 15 days since I have done such an exigent ascent. There could be attacks from the foot of it, at the end or even not happening anything at all, but I like it, just like all other long climbs." Valverde agreed on most of his team-mate's overview of the race so far, and underlined that "both him and I have very good chances in these big mountains", reminding the journalists that “this will be a really, really hard Tour for all of us, with these previous nine days taking its toll at the end”, and remarking that "the race is not lost at all." From Tuesday, Valverde says, "all stages will be crucial: there are either mountain-top finishes, steep climbs like Mende, or short, hard slopes at the end. Tomorrow's stage will bring a 50-minute, one-hour long ascent for the first time in a while, and combined with the rest day, the heat... important things might happen." As well as stating, once again, that the Spaniard's goal is “winning the Tour in Paris with Nairo,” both going to "surely cooperate, no doubt", Valverde reflected on his fitness over the last weeks: “When we analyzed the Tour route, and knowing that I also had to ride the Vuelta, we came to a conclusion that, even though this first week was important, the most difficult part will come up from tomorrow. We worked well, did weeks of altitude training, but didn't overcook myself to reach the depart at 100% condition, but at this very moment. I think I'm at 100% or really close. 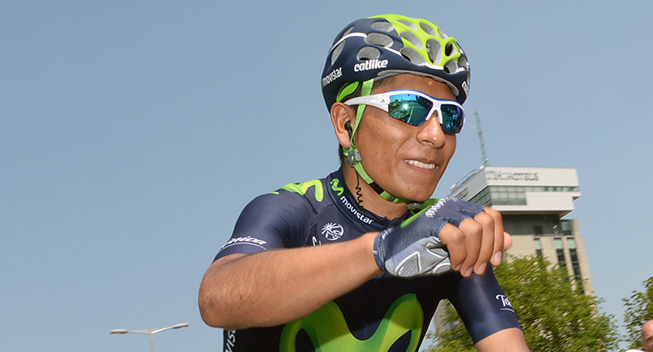 We will fight for Nairo, then we'll think about the Vuelta."